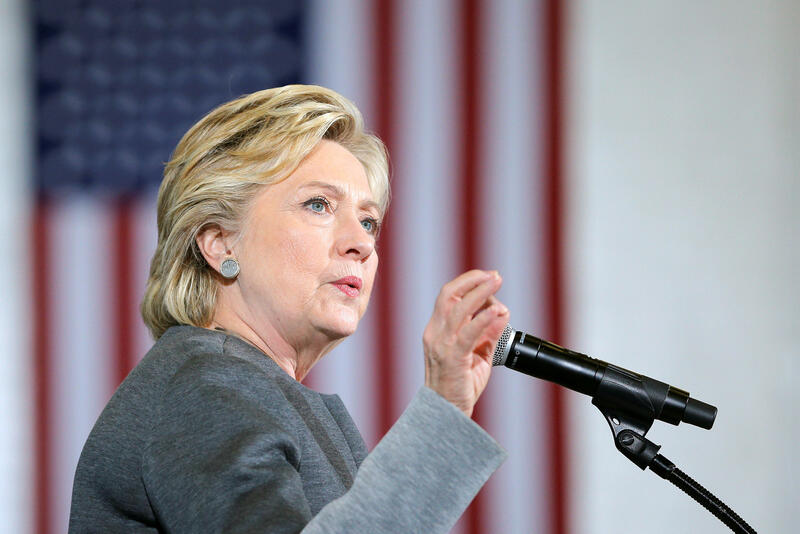 WASHINGTON -- More people are seeking or casting early ballots in the critical states of North Carolina and Florida than at this point in 2012, with Hillary Clinton the likely beneficiary, as early voting shows signs of surging nationwide. Clinton may also benefit from an increase in ballot requests in Georgia, a traditionally Republican state where Democrats have made inroads. But Donald Trump is showing signs of strength in Iowa and parts of Maine, states won by Barack Obama in the last two presidential elections. The latest snapshot of ballot data offers a glimpse into a key question: How much of a vote advantage can Clinton run up before Nov. 8, when more Republicans tend to vote? There are two types of early voting: mailing in ballots and voting in-person before election day. Traditionally, Republicans have done better initially with early mail-in ballots, but Democrats surpass them once in-person voting begins. While the ballot sample to date remains small, Clinton so far is hitting guideposts in several battleground states compared to 2008 and 2012. Though preliminary, data compiled by The Associated Press suggest that advance voting could reach 40 percent of all votes cast nationally - up from 35 percent in 2012. It may also indicate a higher overall turnout in an election that has generated enormous public interest despite - or because of - the unpopularity of both major party candidates. In Ohio, nearly 806,000 voters had submitted absentee ballot applications. That’s up from nearly 723,000 during a similar period in 2012, when a record 1.87 million early ballots ultimately were cast by mail and in person. In Greensboro, North Carolina, Brandon Starkes, 28, cited the state’s unsuccessful bid to impose a voter ID law in his decision to vote early. The law was struck down as racially discriminatory. “I want to make sure I don’t have to deal with issues at the polls on Election Day,” he said. Starkes plans to vote for Clinton. Voting ahead of Election Day has been a growing phenomenon in the United States, designed to make it easier for people to participate in the democratic process. Absentee voting long has been a fixture in elections, and the trend toward greater early-voting has picked up steam, as increasing numbers of states have approved changes in election laws to permit it. This electoral culture change reflects not only interest in voter participation but also the changing, more mobile lifestyle of Americans. In-person early voting begins Thursday in Iowa, while Florida, Arizona and New Hampshire mail out ballots beginning early next month. In North Carolina, a must-win state for Trump, more than 69,150 ballots have been requested and 8,541 have been returned, according to AP data. That’s up from 8,326 ballots returned during a similar period in 2012. By party, Democrats made up 40 percent of the ballots returned compared to 35 percent for Republicans. At this point in 2012, Republicans had opened a wide lead over Democrats in returned ballots, 49 percent to 32 percent, leading to Mitt Romney’s narrow win that state. While Romney was boosted by older whites who voted early by mail, white voters so far have been down this year, to 82 percent from 86 percent of submitted ballots. Black voters, more likely to cast ballots in person, were higher at 12 percent. “Voters appear to be listening and changing behavior in reaction to changes in laws,” said Michael McDonald, a University of Florida professor who runs the U.S. Election Project. Florida doesn’t start absentee balloting until Tuesday, but already a record 2.5 million voters have requested ballots. Republicans are ahead in ballot requests, 43 percent to 38 percent. That’s a much narrower gap than in 2008, the most recent in which comparable data was available. At that time, the Republicans held a solid lead in requests, 51 percent to 32 percent, according to data analyzed for the AP by Catalist, a Democratic firm that helped run data operations for Obama’s 2008 race. Obama won the state by 2.8 percentage points. The 2016 improvement can’t be wholly attributed to fresh Democratic enthusiasm. A change in Florida’s laws meant that voters in 2014 who requested absentee ballots could automatically receive them this year. Still, Democrats welcomed early gains, saying it will free them to target more undecided voters. In Iowa, Democratic requests for ballots continued to outpace Republicans, 63,880 to 24,700. Despite the 3 to 1 advantage, that’s a drop from 2012, when Democrats at this point led 119,318 to 24,909. Clinton plans to visit the state Thursday, the first day of Iowa’s early voting. “Democrats need to run up the score in Iowa, and so far they are not,” said Lindsay Walters, spokeswoman for the Republican National Committee. In Maine’s rural 2nd Congressional District, requests for ballots are down 18 percent, mostly among Democrats. Trump is counting on that district’s one electoral vote as part of his narrow path to the 270 electoral votes needed to win the presidency. If he succeeds, he would be the first Republican since 1992 to win the district in the mostly Democratic state. Maine and Nebraska are the only states that allocate electoral votes by congressional district. In Georgia, the state does not provide breakdowns of ballots by party, but overall ballot requests are up 5 percent to 82,504. By race, requests for ballots by whites rose to 62,732 while those from blacks were down slightly to 16,937, according to Catalist’s analysis for the AP. However, Asian-Americans, who in recent elections have leaned Democratic, nearly doubled to 1,588. Hispanics were lower at 761. Voter modeling by Catalist found that ballots broken down by party were at similar levels to 2012. Obama lost Georgia that year by roughly 8 percentage points. That means to win the state Clinton will have to make up more ground among African-Americans and Hispanics when in-person early voting begins Oct. 17.